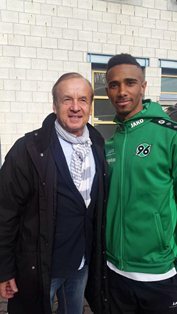 Hannover have confirmed that Super Eagles hopeful Noah Joel Sarenren Bazee suffered concussion in Sunday's 4-1 loss to Borussia Mönchengladbach in a Bundesliga match staged at Stadion im BORUSSIA-PARK. Eight minutes to the end of the first half, the right winger collided heavily with Matthias Ginter and the game had to be held up as the two players were receiving treatment after the sickening clash of heads. Bazee was allowed to continue playing but was finally substituted in the third minute of first half stoppage time. Hannover did not disclose Bazee's expected date of return and informed that Ginter was worse off than the Nigerian. The Germany international suffered a fractured jaw and eye-socket and will be operated on Thursday.